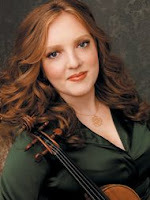 Rachel Barton (Rachel Barton Pine) is an American concert violinist and nationally-recognized advocate for music education born on October 11, 1974 (Perlman was 28 years old.) She began violin lessons as a very young child - before she was four. In addition to her extensive concertizing (as a classical violinist), she is known for devoting herself to teaching through master classes and her concerts and collaborations with hard rock bands. After studying with Roland Vamos (in Chicago) for a number of years, she made her debut at age 10 with the Chicago Symphony, with Leinsdorf conducting. However, before then, she had already performed in other venues (since age 7) and with other orchestras. She has been playing professionally since she turned 14. Beginning at age 16, Barton has won major prizes at various prestigious international competitions, including the Paganini, the Josef Szigeti, and the Queen Elizabeth. In 1992, she won the gold medal (first prize) in the J.S. Bach competition in Leipzig (the first American to do so.) Her discography is fairly extensive and is noteworthy for containing the long-neglected concertos of Joseph Joachim (the second in d minor) and Franz Clement (the one in D major.) In fact, her 2007 recording of the Clement concerto is a world premiere recording. It has been said that it compares favorably with the Beethoven concerto, which Clement commissioned and premiered at age 26 (and which was composed a year later.) Barton’s recording of the Beethoven concerto is on the same CD as the Clement so a comparison of both works is quite easy to make. Unlike other contemporary concert violinists, Barton does not hesitate to write her own cadenzas whenever necessary. She has yet to record the concertos of Mozart, Paganini, Mendelssohn, Wieniawski, Bruch, Lalo, Vieuxtemps, Saint Saenz, Tchaikovsky, Sibelius, Prokofiev, and others. Nevertheless, Barton has recently been championing the works of black composers for future recording projects and for live performances. Her work to establish the String Students’ Library of Music by Black Composers with the University of Michigan – a curricular series - is currently ongoing as well.